Have you ever marveled at how it is that the local weatherman can be wrong more often than not, and yet still get to keep his job? Well, being a TV weatherperson requires great hair and a winning smile...or at least some knowledge of meteorology, but fear not! You can be an Apple analyst instead and be wrong just as often--maybe more. Did you know that the iPhone 5 is coming out in June...or is it September...can I get a November? Surely you have heard that it will be equipped with NFC...and that it absolutely will not have NFC. Maybe Apple will surprise everyone and launch the iPhone 5 at the big 10th anniversary celebration of its retail stores this weekend. Or, maybe it will be an iPhone Nano? How about an iPhone 4S? 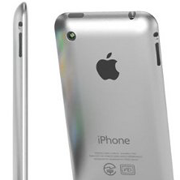 This mock-up of what an iPhone 5 might look like is just the sort of thing that drives Apple speculation. Don't get me wrong, tech rumor and speculation is not limited to Apple. I personally have written my fair share of articles comparing gadgets that are available today against vaporware devices predicted for some time in the future. Has anyone ever heard anything more--at all--about the $35 tablet revealed by the government of India last year? I didn't think so. But, Apple rumors are a phenomenon in and of themselves. The beauty of making predictions about Apple is that you can take virtually any hint of innuendo from any source and spin it into speculation about an upcoming Apple product. The fact that it has the word "Apple" in it is enough to catch the attention of readers and create a frenzy--either for or against. It turns out that those opposed to the Jobsian walled garden are often just as rabid--if not more so--than the Apple "fanboys" they mock. The bonus is that Apple makes it so easy. Apple basically doesn't have a PR department. I don't know that for a fact, but the fact is that it's hard to know anything for a fact when it comes to Apple because Apple doesn't talk. Actually, I was contacted once by an Apple PR person. But, even though she initiated contact with me, she failed to ever respond to any of my emails or voicemails, so that one email from her is all the evidence I have of an Apple PR department. Essentially, unless Steve Jobs says it on stage during one of his magic shows, or personally responds to a user inquiry via email, there is no official Apple position on anything, so analysts and journalists are free to make stuff up. Just throw an obligatory "Apple did not respond to requests for comment" on the end, and you are all set. So, don't fret that you failed to get your meteorology degree. Just find out what the latest Apple rumor or innuendo is, then find some way to spin new speculation that directly contradicts it. It won't matter if you are right or wrong, because by the time we learn what the facts are, attention will be focused on new rumors and speculation.